Morale was a major and often deciding factor in real medieval battles. Not every battle was fought to the death, and instead, tactics often revolved around crushing the morale and organization of the opposition and to scatter them as a means to win a battle. 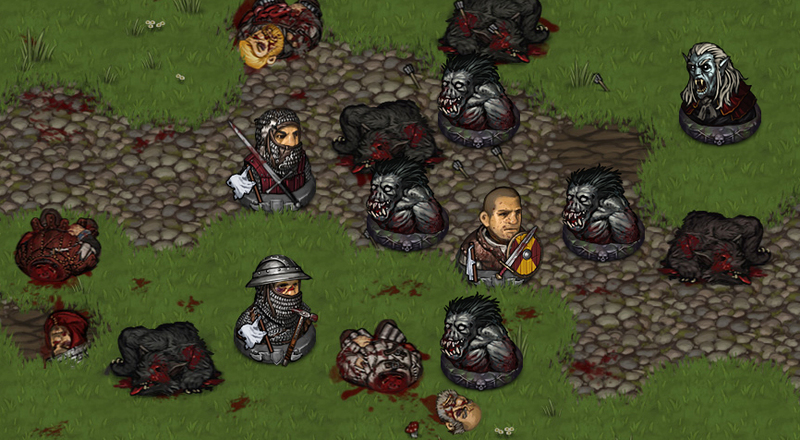 In Battle Brothers we aim to simulate morale as the important factor it is. Indeed, if you’ve played our tactical combat demo, you’ll know that we already have a morale system in place. However, it didn’t turn out all what we wanted it to be, so we decided to do a complete rework. Read all about how the new morale system works below. So what do we want our morale system to be? Most importantly, we want morale to be something that is easy to read and utilize for you, the player. Our new system therefore follows a clear pattern of there always being an action with an intuitive gravity to it, like an opponent being slain, and a following reaction in the way of morale changing. For morale to be easy to read, there should be a clear continuum of different descriptive states of morale, allowing the player to see at a glance how everyone is doing, to act in time, before any Battle Brother mentally breaks, and to understand why anyone would flee when they do. Secondly, morale should be an important gameplay element that both the player and the AI could actively use as a means to achieve victory. To this end, some enemies will employ psychological attacks, like instilling fear and terror, to reduce a Battle Brother’s combat effectiveness and even have him flee, instead of merely attacking them physically. Likewise, the player should be able to press on the flank that has opponents with low morale in order to scatter them, and to reach and kill the opponent’s leader in order to send the opposition into disarray. Considering the morale of Battle Brothers should be equally important for the player, with veteran warriors more likely to hold the front line than recruits as losses begin to mount. With our goals established, let’s see how it works in practice. The key character attribute for all morale related checks is called “bravery”, a measure for overall mental strength and how well a character can keep their confidence and calm when things turn sour. The amount of bravery can vary strongly between characters and opponents as some are more faint hearted while others won’t flinch even in the most desperate of situations – undead enemies even are immune to morale effects altogether. Many of our character backgrounds and traits also directly or indirectly affect a character’s bravery. Like most other attributes, bravery can be increased on level-up to make a character more resilient against all kinds of psychological effects, and some of the perks the player can choose will also open up new tactical options regarding morale. The character is confident that their side will win the engagement and he or she will survive the day, receiving a bonus to hit chance and defense. The character is prepared for battle and in a steady state of mind. This state has no effect on combat performance. There is something unsettling about how the combat is developing. Things are looking a little grim and the character is insecure about which side will win. This state reduces combat efficiency slightly and also gives a malus to following morale checks. Things are going downhill fast, the character is almost sure that the fight is lost, whether personally or as a whole, but is still hanging on. This state reduces combat efficiency significantly and makes it more likely for the character to fail the next negative check and decide to flee from battle. The character decided to turn tail and run from combat to save their life. He or she can’t take any actions and will attempt to move away from all visible enemies as fast as possible. Given some distance to the nearest enemy, there is a chance each turn of rallying again by passing a morale check. If the check is passed, the character will be returned to a “wavering” morale state and can then act normal again. Battle Brothers being in different states of morale after a heavy fight. On certain events, all characters – Battle Brothers and enemies alike – have to pass a morale check. There are two kinds of morale checks: Positive and negative checks. Negative checks challenge the bravery of a character in light of a psychological straining event and if not passed will set their morale state one lower. For example, witnessing an ally being cut down will trigger a negative morale check. All checks are a dice roll against a character’s bravery attribute, the difficulty depending on the severeness of the event that caused the check. Generally, the more powerful a character is and the closer he is to his allies, the more impact his death has on everyone’s morale, and therefore the higher the morale check difficulty will be in case he is killed. Another common event triggering a negative morale check is receiving heavy wounds in combat. Less determined fighters, those with a low bravery attribute, may choose to turn tail and run away, while more determined fighters will choose to stay in line. Vice versa there are positive morale checks that, if passed, will increase the morale state of a character. These may be caused, for example, by an opponent getting slain. Again, the difficulty of the morale check depends on how powerful and how close the opponent was – a Goblin Chieftain being slain is much more likely to improve everyone’s morale than a random goblin out of a dozen more. Positive morale checks can even lead to characters feeling confident about the battle, receiving slight combat boni that represent their belief in winning the engagement and surviving the day. Sounds like a good change. Just wondering, if all your soldiers break and starts to flee, are they gone forever (captured/dead?) or will they live if the escape the map? As long as you don’t decide to officially “abort the mission”, you can keep on fighting. The mission will only end itself when all of your brothers are slain. Whether they can actually run of the edge of the screen or if they automatically rally when reaching it has to be discussed. We’ll decide on that in our next design meeting. Ah okay, so it’s only for the battle you are on. I thought maybe units could exit if they panic and they later show up on the big map. The System sounds pretty good! I actually like the sort of system that is complex but can be broken down to easy general parameters, so you don’t have to use calculus for every battle. There are no plans to include burning arrows for demoralization purposes currently. Afaik burning arrows were used for this in larger scale battles and not in the small-scale encounters the game simulates. However, we do have some ideas on other tools which will allow the player to demoralize the enemy. I like hearing there will be morale bonuses as a reward for fighting well, I feel like I definitely could’ve used that edge in the combat demo.